Since a young age, we’ve all known Halloween for its distinguishing features: candy, costumes, pumpkins, horrors, and the like. However, there’s more to Halloween than the traditions we loved as kids. Halloween should be a time when we think about giving back, not just giving candy. Here are five simple ways you can use Halloween as an opportunity to do good. When nearly every kid in the community is roaming the streets at night, the best thing you can do is ensure their safety. Make a point of talking to your neighbors and community members about looking out for suspicious activity. And drive carefully. Dress up to raise awareness for a cause. As long as everyone’s asking you about your costume, you might as well use your platform to raise awareness for an important cause or issue. The cleverer you are with the costume, the more memorable it will be. It’s an excellent opportunity to create dialogue around causes that deserve the attention. Hand out awareness fliers along with candy. Trick-or-treaters love getting candy, but you can give them more. 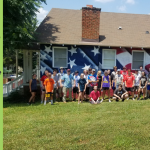 A simple message raising awareness about a good cause can go a long way toward catching their attention and sharing an important message. Collect donations while out trick-or-treating. People tend to be in a giving mood on Halloween, so it can be a fruitful time to ask for donations. Better yet, everyone answers their door for trick-or-treaters, and an activist looking to do good may be a welcome change of pace from the typical trick-or-treater. 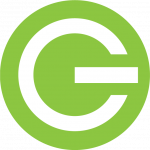 Halloween night is a great time to encourage your community to give back in other ways. Giving candy to children is a great way to brighten the lives of others, but it can also serve as a reminder that people in your own community go hungry. There’s no better time than Halloween to dig through your pantry for foodstuffs to donate to a local food bank, or even to go buy non-perishables to donate. 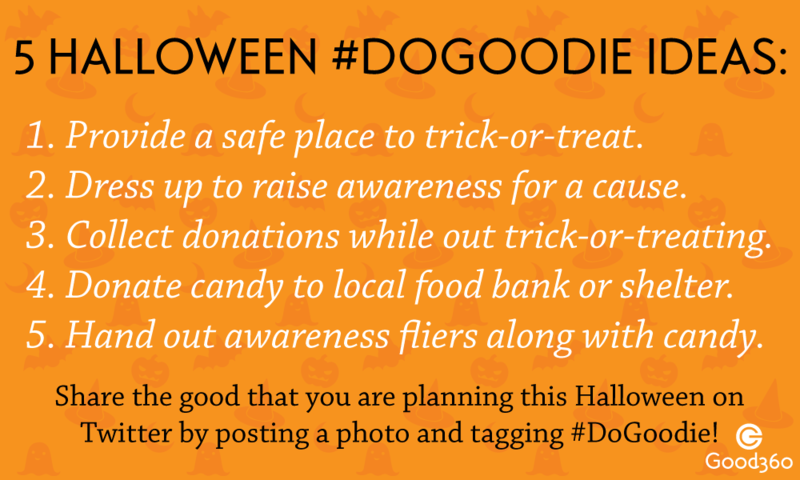 Share this post and encourage others to #DoGoodie on Halloween!